A while back someone posted an image from a period manuscript, I think it was here on myArmoury, of medieval crafstmen sharpening a sword. There are two of them, the sword is lying on a table or bench, and they are running something that looks like a small bow along its length. If anyone can find that image and post it, or something else like it, I would be very grateful. That is a great image, thanks! If I'm not mistaken it shows them using water to remove particles as they do some very fine grinding. I still desperately want that bow-tool image, but if anyone has any other images related to sharpening, please share! 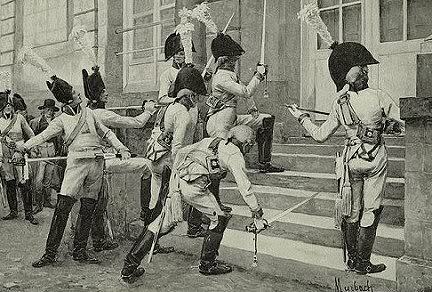 the French embassy in 1806 at Berlin. Picture by Myrbach, I found it on napoleonistyka.com. Is this the thread you were thinking of? It looks as though the 'bow-running' picture is in this, about halfway down. I could be mistaken though. That's not the one, but it's just as good!! Thanks!! Upon reading the OP I thought I remembered such an image in a Michael Pikula post but I did not find it in a few searches. I mention it in case someone happens to think same & is a better searcher. I'm not certain, my memory may be wrong so don't spend time on it unless you'd recall same. The one you are thinking of is marginalia, I have a copy somewhere I will see if I can find it for you. I don't actually see a sword in the above picture though. Perhaps it is bottom left marginalia of Bodleian Library MS. Bodl. 264 folio 49 recto? Two fellows facing each other on a bench, one polishing the fuller and the other the face of a sword blade. Use the zoom function to see it almost full page. Michael, I don't think I've ever seen an image of a craftsman working a sword other than on a grindstone or water wheel. As you know that's pretty coarse work. Late medieval German Hausbooks show just about every trade imaginable, but not one sword sharpener! 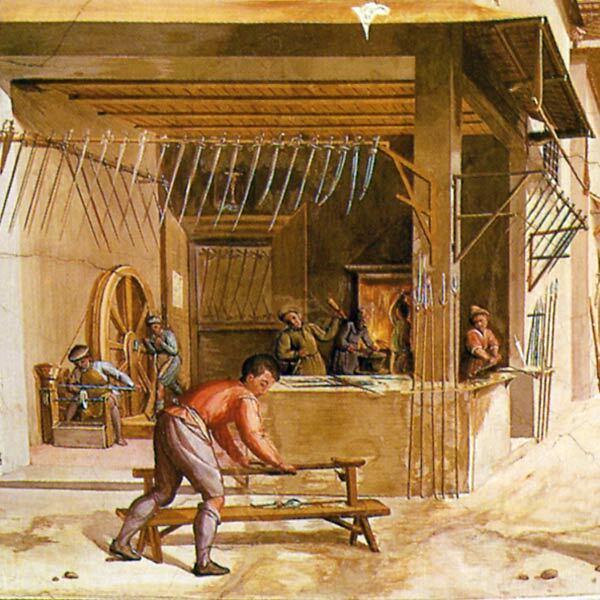 There are plenty of images of metal polishers in numerous trades using buffing wheels or the type of hand tool we discussed earlier. Specifically, look for armour polishers, they almost always show buffing sticks and containers of polishing compound. The general shape of them tends to resemble a modern spokeshave for wood working. Well I've definitely seen this picutre, looked at it very carefully, it was exactly what I described. I thought I saved it, but can't find it. I think Craig knows what I'm talking about because he linked something very similar. Help me, Craig Kanobi, you're my only hope. Well, I did my own search and I thought I found it....only to realize that it's the same one that Kel mentioned. Is this the pic you're thinking of? It's very similar! But not, not that one. However, this is very good (thanks!) because polishing the face of a sword and sharpening are essentially the same thing. The only difference is where you pass that tool. Well I fear I am having to admit defeat. I know I have it somewhere but can not find the image. I will keep searching but now it is probably miss filed some where and I will need to just come across it. If I remember correctly they where leaning over more and the sword was quite distinct. Sorry Mike I know it is some where I just can't find it. Ok so I sit back and started just thinking about the image in my head and I see it and know there are the gold leaves below it and start thinking about the leaves and where they are seen in the manuscripts and it starts clicking and I realize its in the same source as the other image!!!! I did a quick crop for posting. Here it is, using Craig's instructions. Well, that isn't it either...but! It's the same in every way that counts! So, this will do! Mike, are you possibly thinking of the image below? And were you thinking of this thread started by Roland on SFI? : http://www.swordforum.com/forums/showthread.p...sharpening The image below wasn't published there, but it is included in the book he mentions. 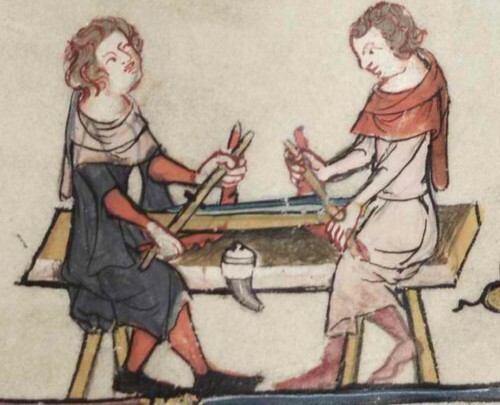 in his recent book on early medieval sword blades, Dr Stefan Mäder published a number of period depictions of sword polishers at work. Their tools seem to have remained pretty much the same for centuries. 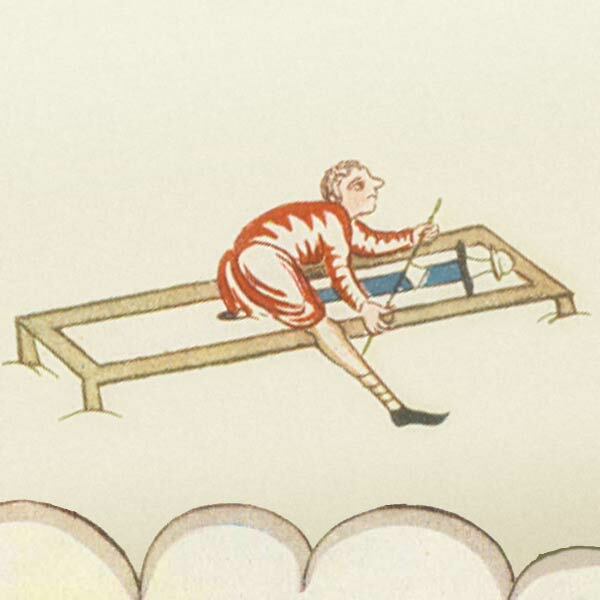 The earliest depiction is from the 9th century Utrecht Psalter, the most recent is 17th century. Polishers used a specific bench with an additional beam mounted lenghtwise on top, like a miniature bridge. The sword would be fixed onto the beam. 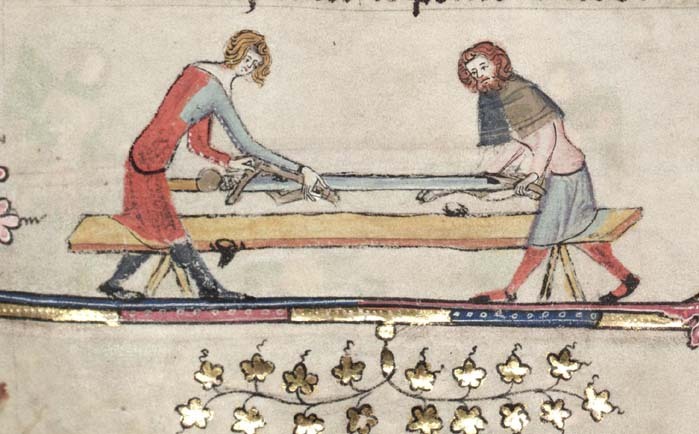 Because blades were often longer than an arm's reach, two polishers would work at once from either end, each polishing his half of the blade, probably with an over-lap into their fellow's half. This would provide a seamless polish. The actual polishing tool consisted of two bows, similar in shape and size to a modern coat hanger. They were held with both hands at their ends in such a manner that they formed an elipse. The two bows embraced the bridge beam and the sword. The polishing pad was fixed to the end of a small peg which was inserted through the center of the top bow. Exactly where a coat hangers hook would be, only on the bottom side. A little horn fixed to either side of the bench would contain the polishing paste for each polisher. The design of these polishing bows allows for a multitude of angles for the polishing pad. To polish fullers would have been no problem. While polishing, the low bow would slide along the bottom side of the beam which would provide consistency and stability as the polishers push forward and pull back. Browse to folio 49 recto, see the miniature at bottom left. This 14th c depiction from the Romance of Alexander shows a straight top stick instead of a bow. But the polishing device inserted into the stick's center is clearly visible. Note the flutes on the bottom side of the lower bow. They may fit into some kind of bearing that is obscured by the beam. The first extensive reserached comparison of sword-making and sword-polishing between Japan and Europe is available now as an illustrated book. It is published as no. 24 in the series of Studies from the Old Arsenal Museum in Solothurn, Switzerland. The historical and technological significance of the craft of the sword-polisher is demonstrated as well as the perspectives for European archaeology when adopting the Japanese method of sword-appraisal. These points are illustrated by three early medieval sword-blades from southern Germany, which are the first European blades to have been polished and documented in Japan according to the traditional methods. The polish was carried out by the art sword polisher Takushi Sasaki. A variety of hitherto unpublished written and pictorial sources for the history of surface-technology as well as macro-photography of the polished blades allow for a new evaluation of the level of European sword makers. There are more than 80 figures, 41 of which are rendered in colour. The book contains summaries in English and Japanese, as well as an extensive bibliography. As it has been published in quite moderate number it will undergo the same fate as most publications in the field of ancient arms and armour: unavailable soon. Sounds like it could really be up your alley, Mike! It looks like the book is sold out (I've written to Dr. Mäder to check for sure), which is a pity, as it sounds like it could be to swords what The knight and the blast furnace was to armour, in a way. However, the good news: here's a link to the PDF of his PhD thesis that it was based on: http://www.schwertbruecken.de/english/starte.htm Unfortunately, the book had had English summary, but the PhD does not. Being in PDF, you could copy and paste into Google translate and at least get the gist of his approach and findings. At the very least, the thesis does have lots of images of sword polishing and sharpening! Thank you very much for your mail and interest. Unfortunately the book appears to be sold out and I have no more copies left. You might still be lucky at the Deutsches Klingenmuseum in Solingen, where they had ordered 20 copies a year ago. I am trying to get a second edition published but this is not so easy at the moment. The book's not showing on the Klingenmuseum's website, but I've contacted them to ask if they still have any; will let y'all know.